We got dirty. I mean really, really dirty. Now get your head out of the gutter and imagine an ATV. You are revving the engine, you can feel it humming. You are then riding down a lush jungle path, sharp turns, lots of bumps, the wind in your hair, dust, dirt, sweat and FUN! Again, we are fortunate to have all this at our doorstep, here in the Mayan Riviera. Yucatan Explorer ATV’s are located right outside Playa del Carmen. We shared an ATV (there is an option for single rider, if you prefer) and we rode through the jungle for about 45 minutes. They are fairly easy to drive, and you have a guide at the front of the group so you just follow the group. 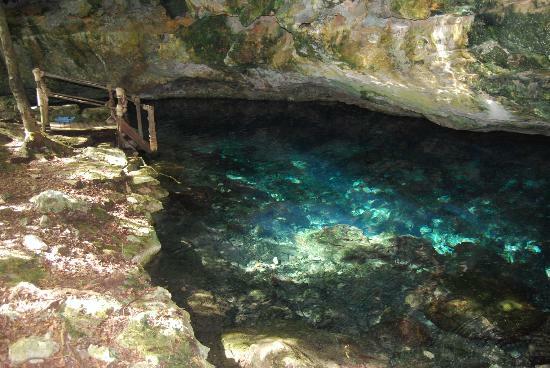 We arrived to this gorgeous half moon cenote. The water was cool (22 degrees), crystal clear and very refreshing. We had the chance to swim, wash off the dust, and we even snorkelled a little bit. The half hour stop gave us time to relax and get ready to head off again. We head off for another action-packed 45 minutes on the ATV, twisting and turning through the jungle paths. Our second stop was at a cave, to see the stalactites and stalagmites. Incredible! A quick journey back to the base camp left us happy, dusty, and ready for a cool drink. The 2 hour tour was great! My son described it as the best day in his entire life. A few tips… Helmets and safety goggles are provided and mandatory (you can opt for your sunglasses), but bandanna’s are optional, they have them for sale. Definitely opt for the bandanna! Wear your swimsuit under your clothes, bring your camera, and a tip for the friendly, helpful guides.